John C Marshall is one of the most influential neuropsychologists of his generation. His impact on the development of cognitive neuropsychology has been pivotal, particularly in the neuropsychology of language. 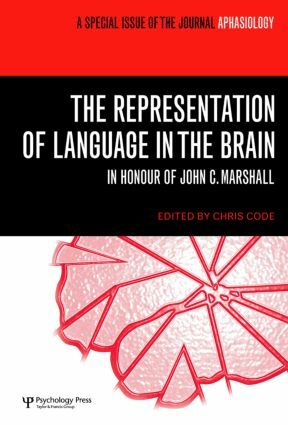 This Festschrift in his honour brings together contributions from his colleagues and friends to celebrate this contribution and presents a comprehensive survey of contemporary and historical issues concerned with The Representation of Language in the Brain. There are contributions on reading, naming, syntax, comprehension, foreign accent syndrome, progressive aphasia, the history of aphasia, treatment, the evolution of language, calculation and embodied cognition. The content reflects John’s own interests in language and aphasia, and it is therefore no wonder that it also reflects current and central issues in the neuropsychology of language. C. Code, C.W. Wallesch, The Form of Representation of Language in the Brain and the Influence of John C. Marshall. Section I: Reading and Writing Impairment. A. Toraldo, B. Cattani, G. Zonca, P. Saletta, C. Luzzatti, Reading Disorders in a Language with Shallow Orthography: A Multiple Single-Case Study in Italian. K. Sage, A.W. Ellis, Using Orthographic Neighbours to Treat a Case of Graphemic Buffer Disorder. A. Castles, T.C. Bates, M. Coltheart, John Marshall and the Developmental Dyslexias. Section II: Language Processing Impairments. D. Caplan, G. DeDe, J. Michaud, Task-Independent and Task-Specific Syntactic Deficits in Aphasic Comprehension. D. Howard, C. Gatehouse, Distinguishing Semantic and Lexical Word Retrieval Deficits in People with Aphasia. C. Di Dio, J. Schulz, J.M. Gurd, Foreign Accent Syndrome: In the Ear of the Beholder? E. Jefferies, J. Crisp, M.A. Lambon Ralph, The Impact of Phonological or Semantic Impairment on Delayed Auditory Repetition: Evidence from Stroke Aphasia and Semantic Dementia. J. Druks, Morpho-Syntactic and Morpho-Phonological Deficits in the Production of Regularly and Irregularly Inflected Verbs. K. Pattersson, N.L. Graham, M.A. Lambon Ralph, J.R. Hodges, Progressive Non-Fluent Aphasia is not a Progressive Form of Non-fluent (Post-Stroke) Aphasia. C. Code, N. Müller, J.T. Tree, M.J. Ball, Syntactic Impairments Can Emerge Later: Progressive Agrammatic Agraphia and Syntactic Comprehension Impairment. Section III: History of Aphasia. M. Perlman Lorch, Phrenology and Methodology, or "Playing Tennis with the Net Down". P. Eling, The Psycholinguistic Approach to Aphasia of Chajim Steinthal. H.W. Buckingham, Was Sigmund Freud the First Neogrammarian Neurolinguist? Section IV: Calculation, Gesture and the Evolution of Language. C. Semenza, A. Grana, L. Girelli, On Knowing About Nothing: the Processing of Zero in Single and Multi-digit Multiplication. D.N. Bub, M.E.J. Masson, Gestural Knowledge Evoked by Objects as Part of Conceptual Representations. M.A. Arbib, Aphasia, Apraxia and the Evolution of the Language-Ready Brain. Chris Code is an Honorary Research Fellow at the University of Exeter.